Jerome S. Bruner is thought of as one of the founders of constructivism, an educational theory which suggests that individuals learn best when they actively participate in their learning, generally in a context-rich, social setting (University of Oregon, 2012). Largely influenced by the research and theories of both Piaget and Vygotsky, Bruner’s writings evolve quite interestingly over the course of his career and encompass over 40 years of contribution to the field of cognitive psychology (Olsen, 1992). 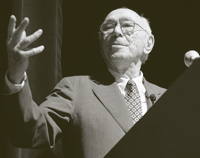 In what is now often called the start to the “cognitive revolution,” Jerome Bruner met with psychologists and linguists such as Chomsky, Simon, Shannon, Weaver and Miller at MIT in 1956 to exchange ideas (Olsen, 1992, p.29). Arising from this meeting was the set of pscychological theories which sought to unseat Behaviorist ideals of the time and to advance the idea that the mind was something altogether different from the causal brain (Olsen, 1992). Straying away from the belief that neurological states or stimulus necessarily caused certain behaviors, the cognitivists (such as Bruner) posited that “what actors though, hoped, wondered about and intended determined speech and action” (Olsen, 1992, p.29). In reviewing some of Bruner’s seminal texts, David R. Olsen (1992) writes, “the psychology Bruner envisions, and indeed contributes to, is a psychology that examines mind in terms of the creation and use of socially shared symbols. These symbols, the products of cultural inventions, are the means by which we construct ourselves and our worlds” (p.30). In other words, learners construct representations of their world based upon interactions with peers and adults and influenced by the symbols of their culture. Bruner argues that “we make up versins of reality and corresponding to each right version, there is a world” (Olsen, 1992, p.30). One of Bruner’s key developments within cognitive psychology is the idea that learners progress through three distinct phases as they construct meaning: enactive, iconic, and symbolic (Presno,1997). Bruner thought that “through action, icons and symbols, people convert reality into their own unique portrayal of reality” (Presno, 1997, p.113). The enactive phase is the “state of doing” (Presno, 1997, p.113). In this representation phase, the learner must watch and do the action, which makes this a particularly hard form to teach, since words and symbols do not clearly represent the action. In the iconic form of representation, learners are able to view or construct a summary image or a “mental picture of a path or pattern” (Presno, 1997, p. 113). Often occurring after the active phase, the iconic phase is more of an internalization of a concept, idea or action to be learned. The symbolic domain consists of language (both numbers and words) which are symbolically assigned to meanings (Presno, 1997). Though it is often the case that a learner will progress through these stages of representation in order to learn, it is also true that some learners with particular skill in the symbolic domain may not need to progress through the enactive and iconic representation phases (Presno, 1997). Teachers would be wise however to offer students the chance to revisit the earlier two phases if it is discerned that incorrect pathways or mental images of a concept had been construed during the iconic phase (Presno, 1997). Finally, Bruner argued that it is essential that teachers “help learners find the most economical and powerful ways to represent their world and in turn become independent problem solvers” (Presno, 1997, p 114). This gets at the heart of constructivist theory. Because teachers are the responsible for creating the conditions under which all students can learn, they must understand the ways in which students learn best (both in regards to actual activites in the classroom and in regards to representational phases). A proponent of “discovery learning” the deeply humanistic Bruner ultimately argues that students should become active participants in the educational process (Olsen, 1992). We teach a certain subject not to produce little living librarians on the subject, but rather to get a student to think... for himself, to consider matters... to take part in the process of knowledge-getting. Knowing is a process, not a product. instruction. Journal of Instructional Psychology, 24(2), pp. 112-118.